Everybody loves a quick fix. Heck, even me, the queen of Stop-looking-for-a-quick-fix loves it when there's an easy solution to a problem. The thing I have against "quick fixes" however, is they usually aren't actually fixing anything. They just mask the issue for the short term so you can go on your merry way, pretending that everything is all fine and dandy- until another problem crops up and you've got to scramble to "fix" that one (which is usually worse than the first). Nope, what I love even more than a quick fix is real solutions. I'm talking about solutions that don't just mask the signs of hormone imbalance, but they actually deal with the REAL reason you are exhausted and irritable and wondering why you feel like you are falling apart when you are only 34 years old. 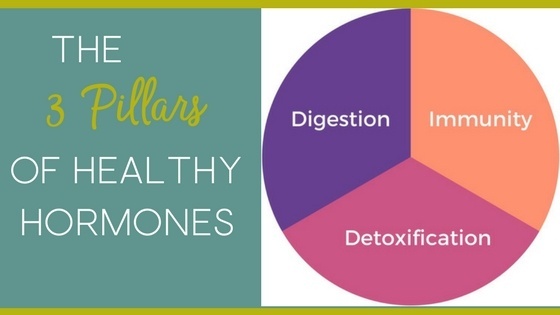 When it comes to fixing your hormones and ditching the fatigue of a sluggish thyroid and overworked adrenals, there is something that most women don't really understand about their hormone health, and it's keeping them from really fixing their hormones and feeling their best. Heres the thing you need to know: Your hormones aren't the problem. Not really. 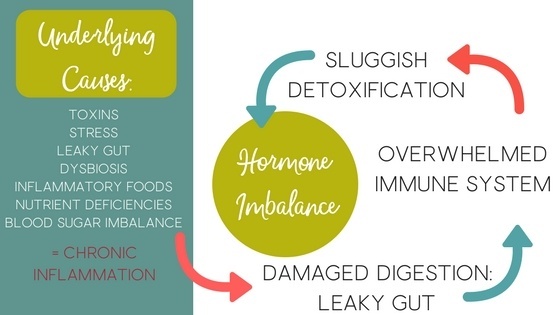 Instead, your hormones are simply caught in the cross-fire of a damaged digestive tract, an overworked immune system and a sluggish detoxification system brought on by chronic inflammation, resulting from one (or more) of the seven underlying causes of hormone imbalance. I'm sure by now you're familiar with the phrase All disease begins in the gut. When you consider that the digestive tract is one long hollow tube that runs from the mouth to the other end, and that nothing truly enters the body until it crosses the gut barrier- a one cell thick lining in the small intestine- you can begin to see why the gut is the place where health can begin to break down. Ideally, by the time food reaches the small intestine, it has ideally been broken down into it's smallest form- carbohydrates have been reduced to simple sugars, proteins to amino acids, and fats and oils to fatty acids. These nutrients, along with micronutrients like vitamins, phytochemical and minerals, cross the gut lining and enter the blood stream, where they are carried to the various tissues and assimilated into the cells for growth, repair and energy production. At least, that's the ideal scenario. In most people, however, the picture isn't quite so pretty. Many women today are dealing with a leaky gut, a condition where the lining of the gut is damaged by certain foods, toxins, medications and even stress. When the gut lining becomes damaged, large gaps can develop in the gut wall. Normally, the cells of the gut wall, called enterocytes, line up tightly next to one another and allow only enough room for nutrients to cross, while acting as a barrier to keep out toxins, larger particles of partially digested food and pathogens that can make their way into your system. So what does all this have to do with your hormones? Well, it's what happens when those foreign substances cross the gut barrier that wreak havoc on your thyroid and adrenals and undermines your hormones. And it has everything to do with the immune system. 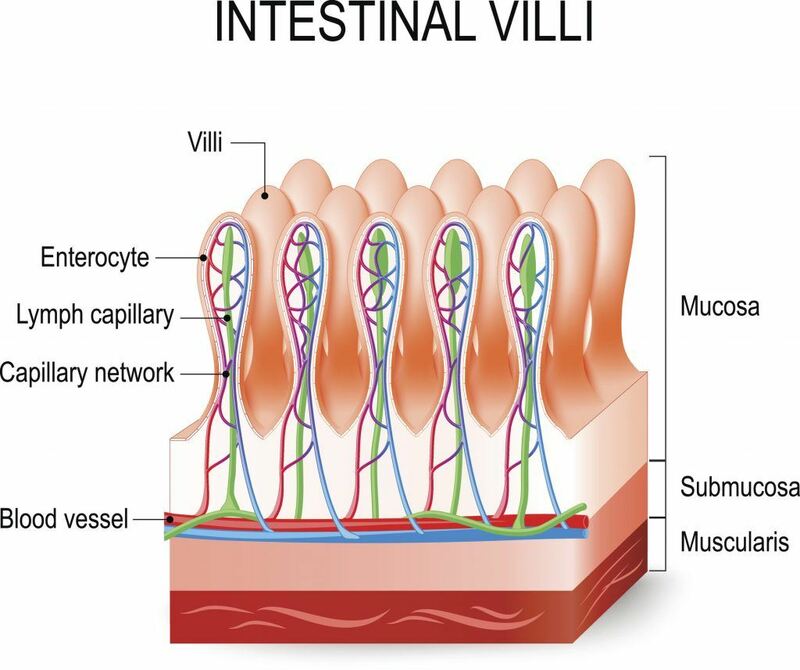 ​You can see in the cross-section of the gut wall, above, how the enterocytes line the villi of the gut wall like little soldiers standing guard. It's their job to keep out foreign invaders and allow nutrients to pass through the gut wall. Lying just on the other side of the gut wall is your innate immune system. In fact, 80% of the immune system is in the gut. Think about it: if the gut lining is the place where outside invaders can cross into the blood stream, it makes sense that this is where you would want to set up your first line of defense, right? ​Again, when you are dealing with a leaky gut, it's like a free pass for toxins, pathogens and partially digested foods to enter the blood stream and make their way to the various tissues of the body, potentially causing disease and dysfunction in their wake. As you know from my article on the 7 Underlying Causes of Thyroid Dysfunction, all all roads lead to chronic inflammation when we are talking about the reason your hormones are out of balance. To make matters worse, most of us are constantly overwhelmed by an influx of toxins- from toxic foods to plastics and pesticides- your immune system is battling an overwhelming amount of potentially harmful substances, and all without the benefit of a healthy gut barrier to keep the toxins out in the first place. Eventually, chronic inflammation results in a breakdown of immune function, ultimately resulting in autoimmunity. Autoimmunity refers to any condition where the body begins to attack it's own tissues. For someone with rheumatoid arthritis, the immune system attacks the joints. In the case of ulcerative colitis, the immune cells attack the lining of the small intestine. And in the case of thyroid disease? The immune system destroys thyroid tissue, resulting in poor thyroid function. In fact, 90% of thyroid disease is autoimmune in nature. Once pathogens, toxins, and partially digested foods​ have entered the blood stream through the gut barrier (and remember when your gut is leaky, it's like a free pass for these things to get into your body), your body has to decide what to do with them. ​As toxins enter your blood stream, they make their way to the liver, your main organ of detoxification. The liver is responsible for sifting out toxins from the nutrients in your bloodstream and packaging them for elimination from the body. So how does this play out when you are dealing with leaky gut? ​ The immune system isn't the only thing to become overwhelmed when the gut barrier breaks down. 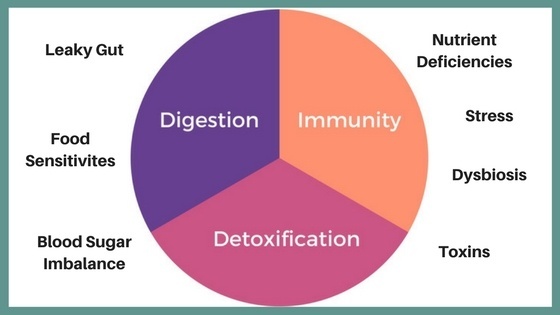 With a free pass to enter your body and create chaos, toxins can quickly overwhelm the liver and inhibit detoxication. For one thing, the liver depends on nutrients such as antioxidants and B vitamins​ to fuel the detoxification process. Because a damaged gut can seriously hamper nutrient absorption, your liver's ability to get the job done just got a whole lot harder. So what does a tired, overworked liver do with all those toxins hanging out in the bloodstream? Package them up and store them in your fat tissues, that's what. As toxins accumulate in your tissues, they can damage your hormones for years without you even being aware of it.​ For instance, certain types of toxins known as parabens, act as estrogen mimickers. Because they can act as estrogen in your system, they create a type of hormone imbalance known as estrogen dominance which can lead to early onset of puberty in children, reproductive issues and cancer. And that's just one example of how toxins derail your hormones. ​So what's a hormonally challenged girl to do? Babe, you've got to address those underlying factors of hormone imbalance and strengthen your digestion, immune system and detoxification. 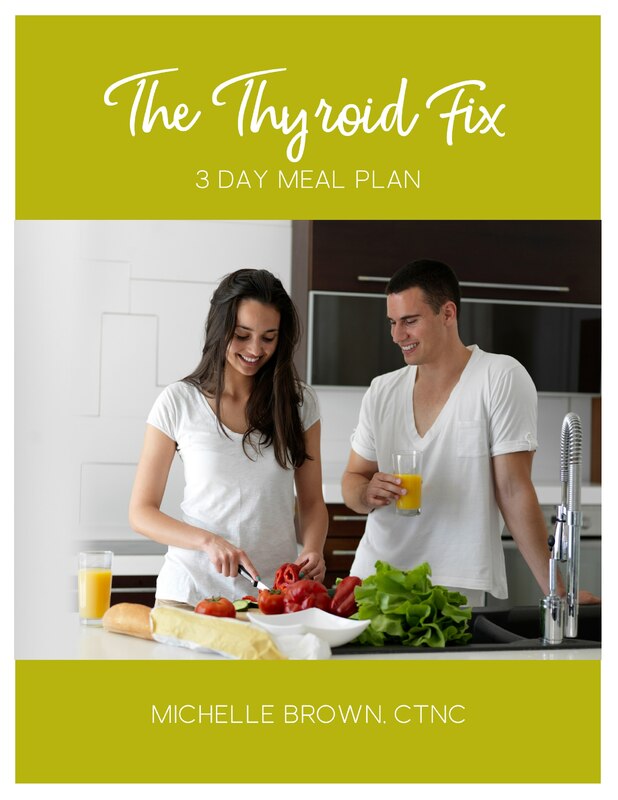 Lucky for you, my Thyroid Fix Roadmap does just that, and you can download it for free below. 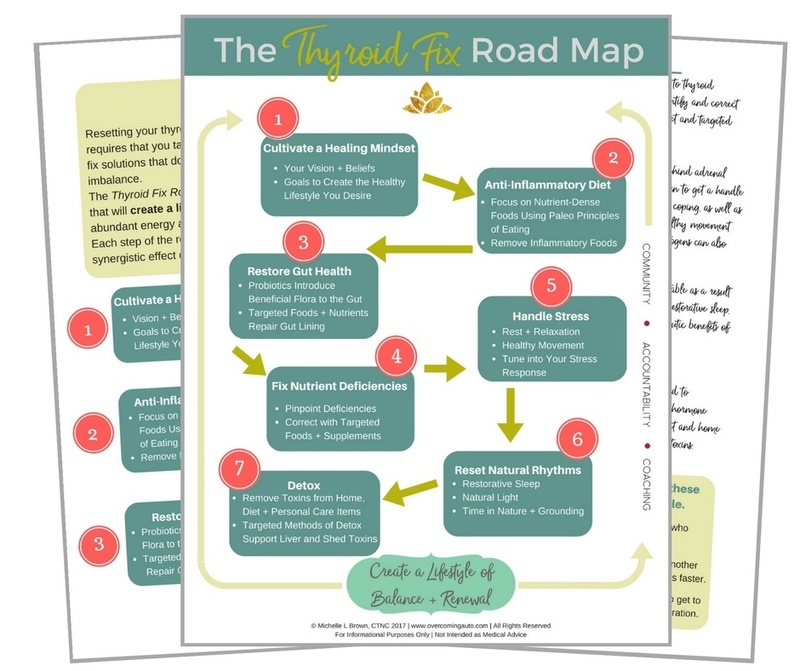 Download The Thyroid Fix Roadmap!